I like the movie it is really funny and cute. I especially love the song, "Everything Is Awesome!" Can't miss this blockbuster film! Definitely worth seeing! I hope they will make a sequel!!! This movies was so AWESOME!!! (Everything is awesome!!!) Emmet was so funny in the movie, haha! I even brought my Lego Emmet, Unikitty and Lucy aka Wildstyle to see the movie!!!!! I wasn't crazy about the idea, ended up being a pretty good movie. This was the BEST MOVIE EVER!!!! I loved the scenes when the Lego people start singing. A depressing indictment on the sorry state of cinema today. MOST AWESOME MOVIE EVER! AWESOMMMMMME! We all.loved it. Our 6 year old went crazy. Very funny, and completely family friendly. Shows the value of uniqueness, but also of working in a team. Humourous and quite enjoyable. This movie is NOT the best and it may in fact be the worst. Greatest Animation EVER!!! Everything is awesome! oh yeah and also.....SPACESHIP!!!! 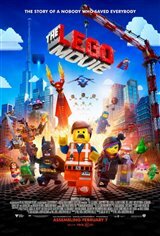 The Lego Movie is the glorious exception to all toy movies ever made. This film has enough wit and humor to keep you hanging to witness a great story unfold, proving to be one of the best films of this year. This is a fun movie, that our whole family enjoyed - me, my wife, our teenage son, and our younger daughter. It's the best family movie that I've seen in a long time. I especially enjoyed Will Arnett's performance as "Batman." This is one of the greatest movies I have ever seen. Some people may think it is cheesy, but they just don't see how good this movie really is. I rate this movie a 5 out of 5. One of the stronger movies of 2014. Beautifully animated, the LEGO Movie really made you feel like a kid again! Already watched 14 times. Watching it right now for a solid 15! So much of The Lego Movie really is awesome. It's one of the few movies based on a toy with no explicit story behind it. And it is, so far, the only one that's really good. Batman was hilarious cute adult jokes and witty. Kids enjoy it too as much as adults. My grandson has watched this movie 3 times. I liked the movie as well. One of the greatest movies of all time!! LOVE!!! watched it with my nephews and keep enjoying it with every viewing. light-hearted and playful with great messages and themes about our life/perceptions/reality.